February 2018 – This week at the Parent Information Session, we launched our 2018 Strategic Plan to our school community. This plan follows on from our 2014-2017 plan and continues the great work we started then. Our school’s strategic plan is a lengthy process and the culmination of many groups in our school community including staff, parents, students and our school Board. A copy of the new strategic plan has been sent home with the eldest child today, and a copy is available via the link below. It is with great pleasure that I present the School’s Strategic Plan 2014-2017. To download a copy, please click on the image to the right. 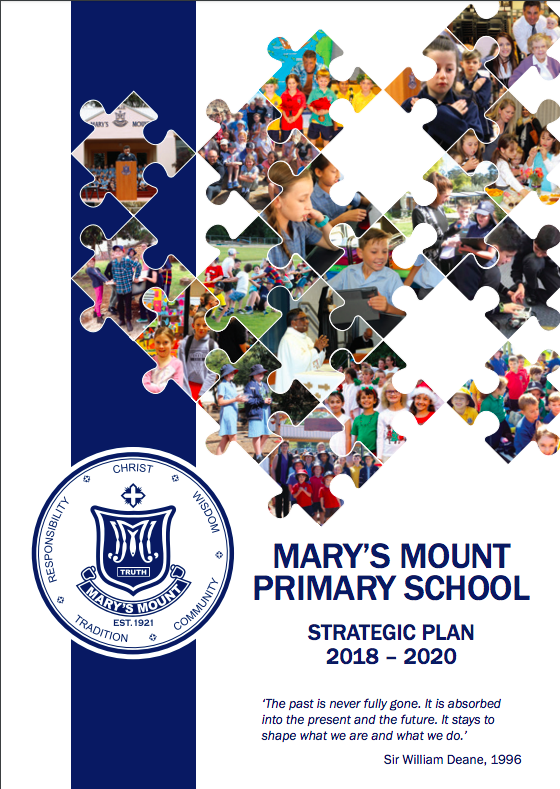 The Strategic Plan for 2014-2017 builds on the 2010-2013 Strategic Plan and is the culmination of a significant effort from our School’s main stakeholders, Board, P&F, Staff, Fr Greg our PP, students and parents. ‘The past is never fully gone. It is absorbed into the present and the future. The quote above reminds us not to forget what has gone before us. It is making us aware that our past is always with us and helps create who are today plus allows us to shape where we want to go. I think the quote also tells us not to rest on our laurels and think how good we are and leave it at that. The quote challenges us so that we can aim for higher achievement in all areas. The Strategic Plan provides detail on seven Key Result Areas of strategic intent that are focussed on ensuring the School adapts to the rapidly changing educational and economic environments while it continues to deliver the highest educational outcomes. From these 7 Key Result Areas we have 37 strategy areas to try to meet over the next 4 years. It has been pleasing that we have made inroads into some of these strategies already. The document also details strategies to ensure the School attracts, retains and develops the best teaching and support staff who are so vital in delivering the School’s educational and administrative agenda. The Plan also is linked to a number of key CEO documents such as the Bishop’s Mandate, LEAD Strategic Direction, QCS and others. The Strategic Plan 2014-2017 will be underpinned by many actions to be developed by the Board, staff and community. It is the Board’s intention to provide the School community with regular updates on the implementation of the Strategic Plan as it progresses throughout the next few years. I would like to take this opportunity to thank all those who contributed to the development of the Strategic Plan, (staff, students, Board, P&F Executive, parents and parish priest.) and commend it to you. I thank you all for your time and effort and professionalism in discussions in many workshops and meetings. We have a school that can be justifiably proud of its high standards, impeccable reputation and strong traditions. The Strategic Plan has been created to ensure that those standards, reputations and traditions continue well into the future through the ongoing development of fine young students. At the end of 2012 we were fortunate to be successful in a submission, (through the CEO), for a Federal Goverment grant called – ‘Empowering Local Schools’. From this grant schools could focus on two areas developing a Strategic Plan or looking at a Finance Administrators. (this would not be something that could be sustained) We decided to focus on our St Plan. The grant allowed us to search for a facilitator to guide us through the process. We were very fortunate to secure the services of Dr Shaun Ridley who was an outstanding facilitator for us. Shaun is the Deputy Chief Executive Director at the Australian Institute of Management. The bonus for us is that Shaun has also been involved with CEO working on various work parties and documents that also link in with our Strategic Plan. Shaun assisted us with workshops and attending meetings separately with all stakeholders. He also assisted with collating the plan through many drafts up to our final document presented tonight. Throughout our meetings Shaun presented us with some challenging thought-provoking questions that opened up our vision as to where we wanted Mary’s Mount Primary School to be and look like in 4 years’ time. Our discussions were engaging and reflective. On behalf of our school community I would like to thank Shaun for being so flexible with his time, so informative for us and guiding us through this whole process from beginning to end. Our school community is very grateful to you Shaun!